People have strong feelings about mushrooms — mushrooms and cilantro. One might overhear a conversation about them and mistake the subject for politics or religion. There are words like “hate,” “disgusting,” and “adore.” I happen to love them. The earthy, umami taste of mushrooms is something I crave. Some of my favorite ways to eat them are in in velvety eggs, a salad of leafy greens and pecorino romano, and any sort of vegetable sauté. Most recently, I included it in a Father’s Day meal with my family. We served it atop grilled steak tenderloin, salad, potatoes, and the most delcious homemade rolls, courtesy of my sister-in-law. My grandma wasn’t so sure of the pesto, but a few other family members (who aren’t keen on mushrooms) loved it. Today I decided it needed to be the star of the show. It may not be for everyone, but it’s perfect, if you are looking for something unique to try! I recommend pairing this with Anaïs Mitchell’s Hymns for the Exiled. It’s weirdness and awesomeness go well with the mushrooms. 3/4 cup freshly grated Parmesan. 5 strips of bacon, cooked according desired doneness. You can obviously leave this out to keep it vegetarian! Place the porcini mushrooms in a bowl of hot water; press to submerge. Let stand until the mushrooms are tender — about 15 minutes. Scoop out mushrooms as not to stir any dirt that may have sunk to the bottom of the water. Discard mushroom water. Combine the porcini mushrooms, button mushrooms, walnuts, garlic, and parsley in a food processor and pulse until coarsely chopped. With the machine running, gradually add the oil, blending just until the mushrooms are finely chopped. 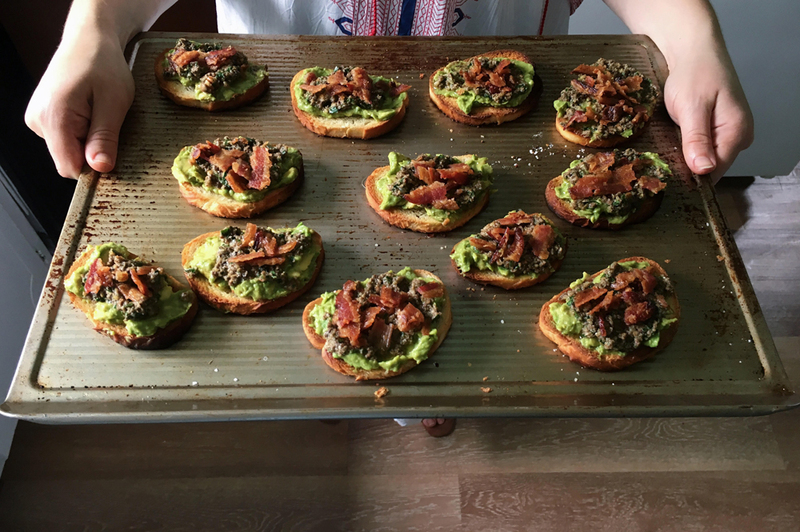 Layer each slice of bread with some avocado, mushroom pesto, and bacon. Enjoy!